The only thing I can tell you for sure is that those are NOT scallops. Definitely baby octopi. As far as the sauce, it might be a sweet chili sauce like that used in many Thai dishes. It's sort of hot/sweet, but definitely not very spicy. Thai/Chinese/Japanese cultures trade on a lot of their home ingredients. 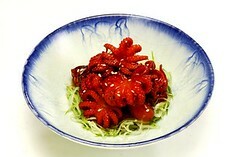 The recipe is also applied on scallops and sometimes jellyfish.